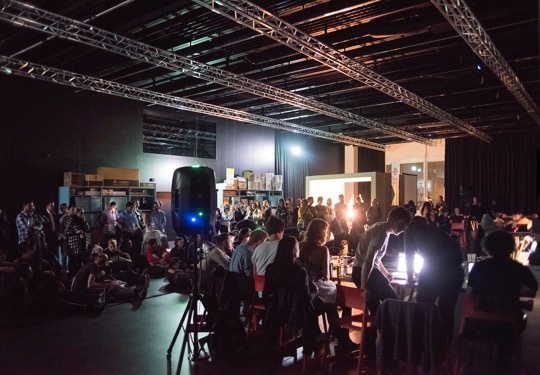 An Interview with Professor Claudia Mareis and Dr Jamie Allen from the Critical Media Lab, Basel | What Is A Media Lab? The lab is a space where things are unready, unfinished, at risk and without known utility. The common root of ‘lab’ and ‘labour’ is also helpful in that it evokes an active, physical space with bodies in it doing things (which can be a rare thing in the hallowed but empty halls of academia). An interview with Professor Claudia Mareis and Dr Jamie Allen from the Critical Media Lab in Basel. How do you characterise the Critical Media Lab’s work and mission statement; what are the defining characteristics of what you do? The Critical Media Lab is a place, a physical location and discursive locale, where we attempt to strike a balance between research, writing and reflection that critically examines our contemporary and historical practices of media, design, art and technology, while allowing space and physical resources for these practices themselves. Simply put, production, in the sense of actually producing something that is not a research paper, book or essay format reflection on some other practice (as writing, after all, is also a practice) should not necessitate either tacit or explicit support of the means, techniques or technologies of that production. Making media doesn’t mean you are ‘for’ more media in the world, and having knowledge of the institutional, organisational, social and political effects of media, technology and design making should allow for more, not less, reflexive practice in these areas. McLuhan once quipped regarding his own status as a reluctant hero of media studies how talking about something does not mean you are in favour of it. Making, doing and practicing media, art and design, although productive, need not be productivist in the sense of exacerbating the logics of mass-media, corporate or ahistorical techno-capitalism. The ‘mission’ of the lab then, which is by no means singular as the lab comprises a number of individual researchers with different interests, styles and directions, is largely to explore what it might mean to make media by ways other than by mainstream, corporatist, or unreflective means. For example, what would a historically informed, contemporary media art practice look like? (“Media archeology as an artistic practice”, Allen & Miyazaki) Likewise but in a somewhat opposing direction, we also speculate as to what ‘other forms’ cultural studies and media studies discipline-oriented research (into the history of cybernetics, say) might take (see collaboration with Kevin Rittberger, where Critical Media Lab interests and research were turned into a public theatre piece, staged in the environment of the lab in Basel). Also important to our work is how new forms of collaboration and research methodologies can bring about these kinds of modulation in formats of presentation, how these presentations remain critical and thoughtful, and a concern for communicating and educating in the context of the lab, within the lab, close to research driven issues, methodologies and materials. 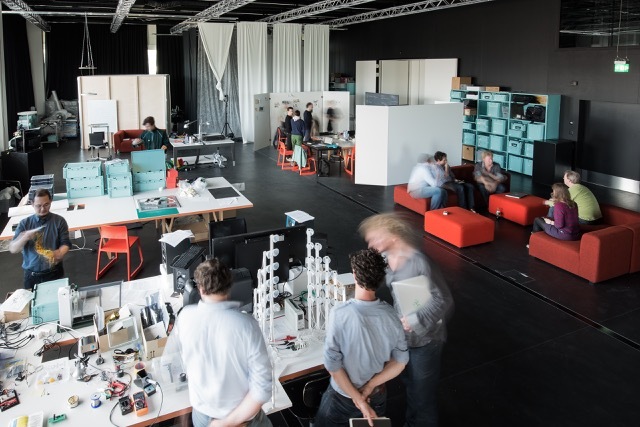 How do you see your Lab in the context of Media and Design Labs – do you use the term “laboratory” in specific ways, both in terms of your physical space and also to refer to a certain mind set of doing, thinking? “Lab” as a descriptor for our Critical Media Lab refers foremost to a physical space — the kind of site you would expect to see developed in the context of media technology, interaction design and art and technology research and teaching. We have the usual stuff — 3D printers and laser cutters and Arduinos and GoPro cameras — and so the space fits the bill of a space that takes up the natural and applied science model of the lab (a room or building equipped with instruments and apparatuses for carrying out experiments, research, or teaching). Instead of polymer chemistry or DNA sequencing (so far), our experiments are tooled toward art, design, media and technology applications. Notions of ‘sample’ and ‘fieldbook/labbook’ that come into play are helpful, as we concern ourselves with what is ‘lost’ and what is ‘found’ in the presumption of empiricism, of acting in and drawing from real things in the world. We might also highlight that naming the space in such a way, by inference if not by injunction, also elicits collaborative working styles, open methods and central notions of testing, trials, enquiry, demonstration, evaluation. The lab is a space where things are unready, unfinished, at risk and without known utility. The common root of ‘lab’ and ‘labour’ is also helpful in that it evokes an active, physical space with bodies in it doing things (which can be a rare thing in the hallowed but empty halls of academia). 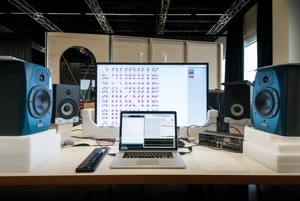 Can you tell us a bit more about your physical lab space and infrastructure – how does it work and how much could we consider it a studio space, or diverging from the classical ways of thinking about the studio? The physical space is a 442m2 blackbox space in the Southwest industrial region of Basel, Switzerland. 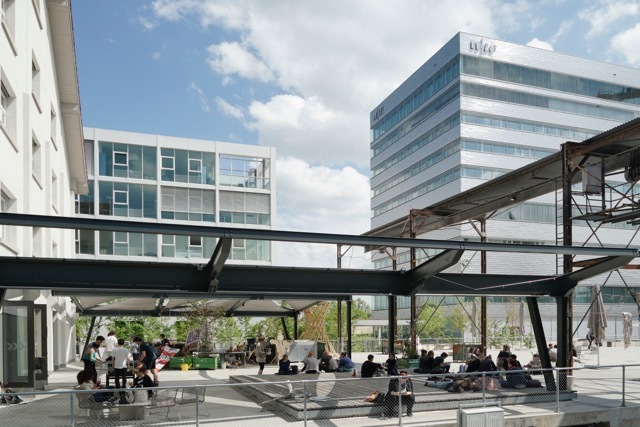 It is situated on the third floor of a new building of the FHNW Academy of Art and Design in Basel that is part of a campus project for digital media, design and art. The campus is the centre of an urban and permanently developing neighbourhood, comprising the FHNW Academy of Art and Design, HeK (House of Electronic Arts Basel), the Atelier Mondial International Arts Exchange Program Basel (formerly iaab), Radio X, the exhibition space Oslo 10, and the archive and residential building of the architects Herzog and de Meuron; official institutional public relations numbers 400 creative enterprises in the immediate vicinity. Invoking the idea of the ‘studio’ (also, as with ‘lab’, a metaphor of mythic proportions!) isn’t completely out of place, but there are definite differences. The studio, and the tradition of studio arts in general, particularly in slow-to-change institutional cultures like art schools and universities, still largely inhabit a world where the studio is a sacrosanct place of experimentation and failure. This is a sympathetic association with ‘labs’ in general, and the CML. Unfortunately, calling in ‘studio’ metaphors, in the sense of the modernist trope of the ‘artist alone in his or her studio’, also too often stages a scenography of highly private, ‘backstage’ environments where notions of sharing and openness are nurtured less than more hermetic, even alchemical romanticisms — the spectors of intuition and singular invention rearing their ugly heads, just as these ghosts are exhumed in the service of ‘creative industries’ and ‘innovation’ economies. The classical studio does not admit new techniques and methods readily (to the point of often being unaware of the very methods being used therein! ), and that would be another point of divergence with our idea of a ‘lab’. In these ways, laboratories in general and the Critical Media Lab in specific should be highly divergent from the classical notion of the studio, although we should like to retain the ways in which studios help artists, critics, creators and designers maintain individual or collective control over how their process and work is represented and presented. Your work engages with technologies but also with infrastructures. Can you give examples of what sort of projects this means? Are the projects of the speculative (design) kind, or is that a misleading characterisation? One way to capture what you’re asking about, as Claudia Mareis did once at the end of a presentation Jamie Allen gave on his infrastructures work, is by describing a kind of ‘materialist post structuralism’ after Foucault, or an ‘institutional critique without aesthetic distance’ as people like Brian Holmes have tried to capture with his notion of extra-disciplinary practice. This would be true of the critical historical investigations of researchers in the lab (Claudia Mareis, Shintaro Miyazaki, Moritz Greiner-Peter, Häsler Leonie, Jamie Allen) with more and less varying focus on alternative (non-textual) forms of outputs. The central idea is critique as a form of establishing the ‘conditions for the possibility of…’ a certain practice and then either describing these conditions or using, modulating or intervening in them. Flavia Caviezel and Johannes Bruder are engaged in more contemporary studies in a similar vein: As a visual ethnographer Flavia is working on network mappings of regional waste and recycling processes as related to digital media and communications, and Johannes is looking at what subtends and scaffolds the experimental technological practices of sciences and ‘subcultures’ and their sustainability as technosocial agglomerations. All of this work, then, is in some sense ‘infrastructural’ if we take this term to refer to a study of the ways that structures emerge, or appear to emerge or are made to appear to emerge. Some of this work is also ‘speculative’ in the sense that it unearths and reprograms histories and disciplinary perspectives through alternative outputs and idiosyncratic topicality/theory. What we might now call ‘traditional’ speculative design (London RCA, Dunne & Raby) is also represented in the lab through work by people like Susanna Hertrich and Ludwig Zeller. Who uses the lab – what sort of people come in and out, visit the physical space, and participate in the lab? Research at IXDM is approached from an inherently interdisciplinary perspective. We draw on the diversity of backgrounds in sociology, cultural and media studies, engineering, design and media arts, and lab’s use is driven by Institute of Experimental Design and Media Cultures’ interdisciplinary researchers. 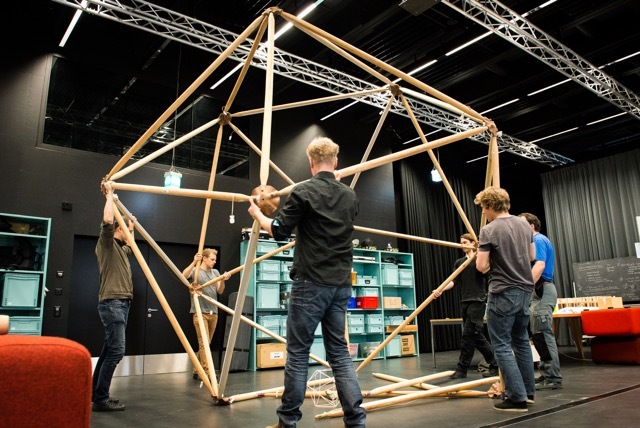 These are people variously engaged in art, design and technology projects that require space, technologies and implementation space for testing and preparation for exhibitions, demonstrations, or installation in other venues. There are visitors and visiting researchers, as well as guest lectures, delivered by people with profiles that are many and various. There are frequent lecture series where guests from various academic and artist, design and cultural sectors are invited to present their work. 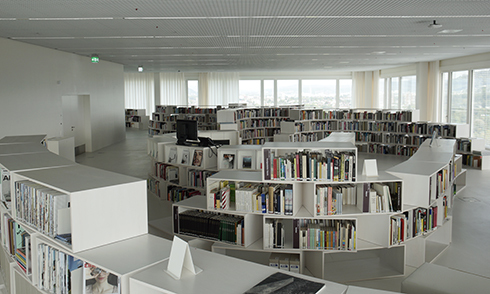 There are likely ‘colloquium’ sessions which often involves guests from other institutions, either as discussion partners or experts on a given text or in order to broaden an area of example projects (recently the Critical Media Lab has partnered with the University of Basel — Ute Holl and Markus Krajewski, et. al — in order to produce an extended colloquium series called “Medialogue”). In ways related to the above, but more specifically, we are interested in workflow and how labs work; how do you structure the work in the lab? Does it have a specific hierarchy? How do you decide what sorts of projects are initiated and pursued and how work is then divided? The lab is part of the Institute of Experimental Design and Media Cultures directed by Claudia Mareis, who we could say ‘curated’ (hired) the initial cohort of individual researchers in the group. These researchers are a mix of junior (some PhD students) and senior researchers, responsible for research development (getting grants from agencies like the Swiss National Science Foundation SNF or the Commission for Technology and Innovation CTI) in order to fund their work, as well as for small amounts of teaching and institution-wide development (working with strategic groups like on things like campus-wide ‘media strategy’ or summer school offerings). Individual projects are developed in conversation between senior and junior researchers and Claudia. So far, projects have been based on individual research histories, trajectories, interests and passions, as they align with the general style of the lab to approach topics of past and present media, within milieux of design and technology. The work on each project varies according to the researcher leading the work, the financial instrument requirements and the stated outputs of the work according to proposed work plans. There are few over-arching restrictions as long as the projects fit into the research profile of the institution and financial and budgetary concerns are managed. Although there is some support for management that has just been introduced at the central university level, the responsibility falls with the lead researcher on the project. Is the lab funded internally or what is the relation to outsider funding, whether grants or corporate funding? 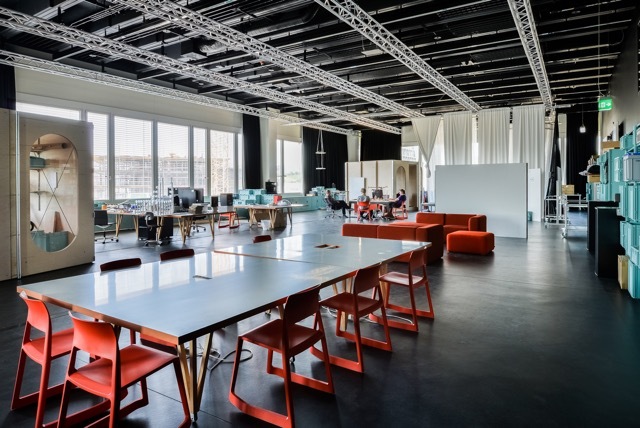 The lab itself is systemically funded by the FHNW Academy of Art and Design. The university group put forward the initial funding to get materials and equipment for the lab, provided space for the facility, and gave initial moneys to develop the first team, hires that would then be responsible to secure further funding. Lab researchers then put out bids for various kinds of project-specific funding, including technology design research grants, Swiss scientific research funding (SNF), and cultural moneys from national arts funding organisations. Corporate funding has not yet become a focus, although there is interest in working with foundations, upcoming, in order to fund a set of public lectures and a podcast series. Likewise, it would be of interest to investigate supported or collaborative third-party funded projects that involve other research organisations of diverse approaches (e.g. : BMW Guggenheim Labs project in the U.S.).